1. One of my strongest beliefs is that literacy builds a better society. 2. My tummy is starting to get huge! 3. The sky is cloudy with a threat of rain and wind and cold, so it's the perfect time to curl up with a suspense novel. 4. A steaming hot shower after an extra long day at the office is comforting to me. 5. I always thought I'd be a covert operative investigating a secret plot to takeover the world. Alas, there were no secret plots to be found. 6. My cat Parker insisted I follow him; he led me straight to the back door, so I scooped him up in my arms and then we went outside to look at the full moon. 7. And as for the weekend, today I'm looking forward to enjoying a day free of doctor's appointments and other commitments (except maybe a few must-do chores around the house); tomorrow my plans include dragging Anjin around looking at baby cribs; and Sunday, I want to write a couple of book reviews and catch up on my blog hopping! It's been one of those weeks. You know the kind. I have been battling a cold the last several days, most recently a nasty cough, and my lack of sleep has caught up with me. It was a long week at work and yesterday was especially exhausting. So it was with a little bit of reluctance that I detoured by the mailbox yesterday evening, sure all I'd be met with was an empty box. Instead I found a package. And not just any package. It was from my dear friend and fellow blogger, Melody of Melody's Reading Corner. I confess I got teary-eyed when I saw what was inside the box . . .
Awwww that sweet of Melody! I'm sure your baby girl will look cute in it! How sweet! I'm sure that was the perfect pick me up for you at that time! Hope you get rested up and feel better soon! That is so sweet :o) Looking at baby clothes & booties just makes you feel so warm inside. Love your response to #1! I had a similar pick for #3. Here's my Friday post. Have a great weekend! Feel better Wendy. I totally agree with your belief (#1). And, oh my goodness, we all know Melody is a sweetie and this just proves it. How lovely and thoughtful. Have a good weekend! What a lovely treat to brighten your day! That's really sweet of Melody. The set is so pretty! Adorable!!! 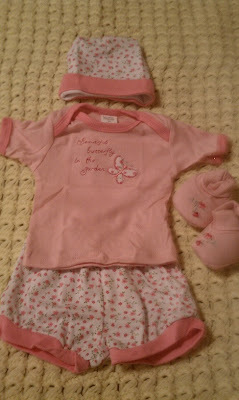 She'll look like a little angel in that cute outfit!! You need to make sure that you take as much time to curl up and relax while you can!! LOL!! but it is all worth it, even those late night feedings!! 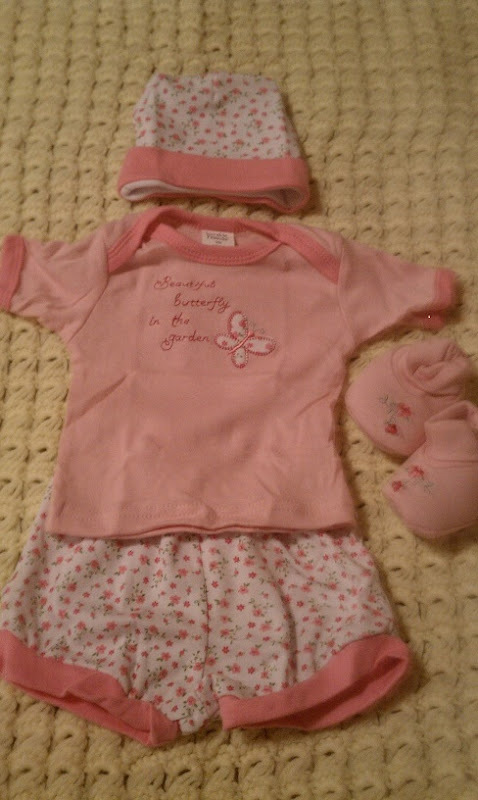 Oh, what a sweet little outfit from Melody!! And cribs, huh? How fun! Do you think you'll get a convertible one (which converts to a bed) or a crib crib? Very sweet gift. Aren't book bloggers great?! I still can't get over Melody's generosity. Thank you so much, Melody! It's such a cute outfit. Thank you everyone for your comments. I've fallen behind so am doing a few mass ones. I really do appreciate you stopping by.